Apple has today released with watchOS 5.1.2 the third update of the operating system watchOS 5, which runs on modern Apple Watch models. watchOS 5.1.2 will be released one month after the release of watchOS 5.1.1, an update that introduced new emoji and color clock faces and fixed a brick bug introduced with watchOS 5.1.
watchOS 5.1.2 can be downloaded for free via the Apple Watch app on the iPhone under General -> Software Update. To install the new software, the Apple Watch must have at least 50 percent battery, it must be in a charger and must be within easy reach of the iPhone. .2 introduces the long-awaited ECG feature for Apple Watch Series 4 models in the United States. 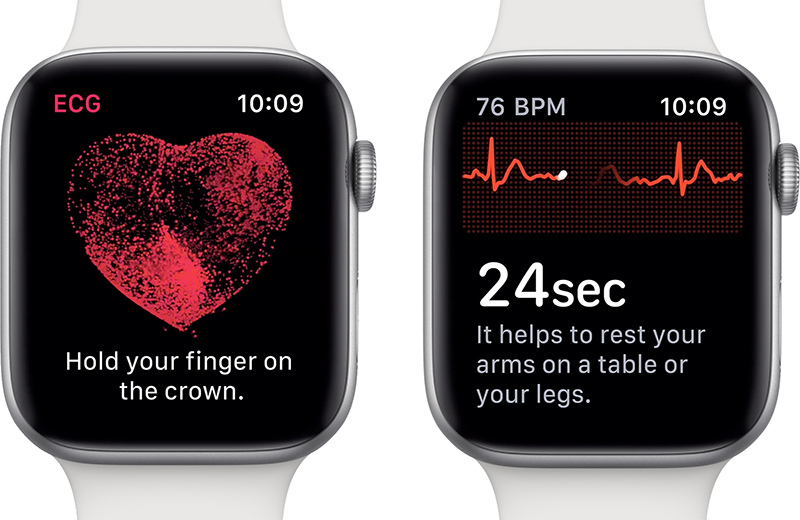 The ECG function uses electrodes integrated into the back of the Apple Watch Series 4 and the Digital Crown, allowing users to record an electrocardiogram with a cord and the wrist-worn device. An ECG measures the electrical activity of the heart and is often used to diagnose heart problems. In addition to the ECG function, watchOS 5.1.2 introduces a new feature that notifies you when the Apple Watch detects an abnormal heart rhythm that indicates atrial fibrillation, which may indicate a serious health problem. The ECG feature is limited to Series 4, but irregular heart rhythm notifications are available for all Apple Watch models running watchOS 5 – this is Series 1 or later. The watchOS 5.1.2 update introduces new complications for the Apple Watch Series 4 infograph dials. Added complications include Email, Messages, Home, Maps, Apple News, My Friends Search, Phone, and Remote Control can now be assigned to the available complication slots on the infograph dial. For most of these complications, the icon provides quick access to opening an app rather than forwarding information such as unread messages or emails. watchOS 5.1.2 also includes a new switch in Control Center that allows the walkie-talkie feature to be turned on and off. This makes it easier to disable walkie talkie when it is not in use and turn it back on when needed. – Adds the ability to receive an alert when an irregular heart rhythm is detected that appears to be atrial fibrillation (USA and US only).